Do believers in a divine designer really believe in a God of the gaps? 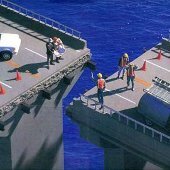 Some opponents of intelligent design say that because it draws on what is in their view an inevitably theological explanation, it must be a kind of “god of the gaps” way of reasoning. One such critic says that “A theory such as ID posits what is pejoratively known in philosophy as a ‘God of the gaps’: in short, it slots the concept of a God into any feature of existence which science or reasoning cannot explain (for the moment).” Proponents of intelligent design maintain that this is a mistaken analysis of their position. Which of these two competing claims is correct does not interest me here. The point is that once a person is found guilty of using “god of the gaps” argument, they are at fault and should withdraw their argument. That much at least is accepted by proponents and opponents of Intelligent Design. What does interest me, however, is the way that some (but surely not all) opponents of belief in God may be tempted to read far too much into the objection that someone is using a god of the gaps mentality. Let’s imagine that the following is true: God does not intervene in the world. Once upon a time people who were more ignorant than we are thought that gods, angels, demons, spooks or spiritual forces lurked behind everything that we didn’t have a handy natural explanation for (like comets or volcanoes). But in fact, this is all god of the gaps reasoning, and God doesn’t intervene in nature at all. Never. There is a true natural account for everything that goes on in the universe that we know of. If you don’t think that’s true, relax. We’re imagining, OK? I don’t think that the above is true, since I’m one of those crazy people who thinks that at least some miracles have taken place. But let’s suppose that the above account were true. Here’s where things take a step off the cliff of logic. Take the above account, and then add the following statement: “Therefore, since God isn’t required to explain any phenomenon, we have no need of the God hypothesis at all, and we have as good as shown that he need not be thought to exist.” God, some have said, can now be treated as a redundant hypothesis that explains nothing at all. Nothing. This is where things turn pear shaped. Often I think that people who are very good at the work of science should stick to science and not venture out into metaphysics (I’m sure this is by no means true of all scientists, many of whom might be quite good philosophers too). This is what can happen when such a venture goes wrong. Science has been spectacularly successful in probing the nature of the physical universe and elucidating the mechanisms by which the universe works. Scientific research has also led to the eradication of many horrific diseases, and raised hopes of eliminating many more. And scientific investigation has had another effect in a completely different direction: it has served to relieve a lot of people from superstitious fears. For instance, people need no longer think that an eclipse of the moon is caused by some frightful daemon, which they have to placate. For all of these and myriad other things we should be very grateful. But in some quarters the very success of science has also led to the idea that, because we can understand the mechanisms of the universe without bringing in God, we can safely conclude that there was no God who designed and created the universe in the first place. However, such reasoning involves a common logical fallacy, which we can illustrate as follows. Take a Ford motor car. It is conceivable that someone from a remote part of the world, who was seeing one for the first time and who knew nothing about modern engineering, might imagine that there is a god (Mr Ford) inside the engine, making it go. He might further imagine that when the engine ran sweetly it was because Mr Ford inside the engine liked him, and when it refused to go it was because Mr Ford did not like him. Of course, if he were subsequently to study engineering and take the engine to pieces, he would discover that there is no Mr Ford inside it. Neither would it take much intelligence for him to see that he did not need to introduce Mister Ford as an explanation for its working. His grasp of the impersonal principles of internal combustion would be altogether enough to explain how the engine works. So far, so good. But if he then decided that his understanding of the principles of how the engine works made it impossible to believe in the existence of Mr Ford who designed the engine in the first place, this would be patently false – in philosophical terminology he would be committing a category mistake. Had there never been a Mr Ford to design the mechanisms, none would exist for him to understand. It is likewise a category mistake to suppose that our understanding of the impersonal principles according to which the universe works makes it either unnecessary or impossible to believe in the existence of a personal creator who designed, made, and upholds the universe. In other words, we should not confuse the mechanisms by which the universe works either with its cause or its upholder. John C. Lennox, God’s Undertaker: Has Science Buried God? (Oxford: Lion, 2007), 43-44. Amen. And I would also add that the mere fact that some entity is explanatorily idle (not that I think God is explanatorily idle) is not by itself good reason to deny that it exists. In fact, it’s not necessarily even grounds for withholding belief that it exists. Suppose we concluded, for example, that we could explain everything in the world without invoking human persons (suppose we concluded that we could have a comprehensive explanation of everything that merely appealed to subatomic particles, their properties and their interactions). That, by itself, would be no reason to withhold belief in the existence of human persons. Where it is appropriate not to believe in an entity that turns out to be explanatorily idle are cases in which the primary grounds for believing in it would be for explanatory purposes. If scientists came up with a well confirmed gravitational theory that explained all the same phenomena that dark matter is invoked to explain without appealing to dark matter, for example, then that would be a good reason not to believe in dark matter. The sole reason to believe in dark matter is to believe in it as an explanatory posit. But we do not believe in human persons because we accept them as explanatory posits. I’d say (to tie into your previous podcast) that belief in human persons is simply one of those deep, pre-theoretical beliefs that we have about the world that is properly basic. Likewise, most people to not believe in God because they accept him as an explanatory posit. Some arguments for theism treat theism as an explanatory hypothesis (just as some arguments for the existence of other minds treat the hypothesis that there are other minds in that way). But that is not how belief in God is typically accepted. And, for that reason, many atheistic arguments to the effect that theism is irrational or unwarranted because theism is (allegedly) explanatorily idle are misplaced. They illicitly treat theism like something it is not – an explanatory hypothesis to be accepted or rejected solely on the basis of its explanatory power. I haven’t listened to / read many of your podcasts/posts on dualism yet, but I’ve been wondering how this relates to ID. The ID proponents all seem to be against materialism in the philosophy of mind (definitely against eliminative materialism) and seem to want a personal/agent type of cause accepted into science. Can this fit in with your physicalism wrt humans? I guess I don’t see why not, presumably you still think God is an agent-cause of some kind – but if I understand the Christian physicalist position (and I don’t really) it might make the analogy from human to divine design a bit suspect. And even if we think the design inference is an ‘inference to the best explanation’ presumably there’s still an analogy hiding in there somewhere, re: agent causation. A subtext to my question is whether you think there’s anything in the fairly recent Christian defences of dualism e.g. Taliaferro/Goetz: Naturalism, Moreland: Recalcitrant Imago Dei(?) If you can decipher this, thanks. Andre, most vocal published proponents of Intelligent Design are north American envangelicals. It’s my view that a dualist view of humans is part of their cultural baggage that they started out with, and have never given up. But in short, you certainly don’t need to be a mind-body substance dualist in order to believe that some non material things or beings exist (like God). I guess I don’t see how the design inference has much (if anything) to do with the substance that the designer is made of, so there shouldn’t be any problem with a human design / divine design analogy. As for the recent work on dualism, I’ve read some of what Goetz has to say (but not a lot), but I haven’t read Moreland’s material. I think that when it comes arguments to dualism, there’s little that’s new under the sun. Plantinga’s modal argument is new I guess, but I don’t think it establishes anything. I’m trying to work out what the issue is myself. My concern is at least partly to do with the response that some materialists seem to have to ID: they can’t conceive of a non-material cause. I think I’ve heard Richard Dawkins and/or Peter Atkins on this. As soon as someone starts using an analogy for design, e.g. involving Mr Ford, they’ll say that since “mind” is now known to be physical (at least in the case of human minds – you never know what those crazy aliens are doing) ID folks can’t just go and invent a new category of ‘intelligent causation’ (or similar) – as the only “intelligent causation” we know anything about turns out to be physical. The problem is perhaps with the category of ‘design’ (in an interventionist, or ‘non-Deist’ sense). It depends on your view on how the mental realm gets created and the causal relations involved. But if it’s all physical and/or just some kind of simple emergence from the physical, then the concept of human “design” as separate to law/necessity & chance (a la Dembski) seems rather weakened. If mind is reducible, then so is design; and then what we’re left with is at best difference between ‘categories’ in degree (of complexity) rather than in kind. It makes the analogy woollier. Well I don’t think that proponents of ID need to include any reference to the non-material in their case. All they need (and indeed all they claim to have) is reasons to believe in design at a cellular level. Obviously humans – even with minds that supervene on the physical – did not have a hand in this, so who did? Of course, people can project all sorts of things into the black hole of what the deigner was – aliens from another planet being the choice of some. But the only point ID seeks to make here is that whatever it was, the design was intentional and could not have arisen without an intelligence behind it. When we’re talking about humans, it’s true that some physicalists don’t believe in mental causation (e.g. epiphenomenalists) – however plenty do. Nonreductive physicalists are an obvious example. I certainly can’t say that I’ve ever encountered a book about physicalism and how God’s still ok & allowed to cause stuff, just because I don’t think I’ve encountered a theistic physicalist who ever felt it necessary to defend the idea that anthropological physicalism posed a problem for theism and (for example) miracles. I guess if one rejected dualism because he declared that it was logiclly impossible for the non-physical to ever interact with the physical, then he would have a problem affirming traditional monotheism. I don’t say that, however, and that’s not why I’m a physicalist. Mind/body interaction is a really hard thing for a dualist to give an account of, of course. Typically they just say that no account is required, or that none is possible. Those who think religionists slot God into everything they don’t understand (yet) have completely missed the point. We slot God into EVERYTHING, including things we do understand. Glenn wrote: ” I’m one of those crazy people who thinks that at least some miracles have taken place”. Please name one that you believe has occured within the last milennium. T.A.M., well I didn’t say that any miracles have occurred in the last millennium, so I don’t know why you supposed that I must think that any at all had taken place in that time. I don’t challenge people to name a big bang that has happened in the last milennium, but of course I understand that if I did, it would not be any real challenge to those who believed that at least one big bang had taken place at some point. However, if you’re interested, I’d say that this case of a purported miracle looks interesting enough. IMHO, snake oil my friend. My wife is a speech language pathologist. I just asked her to listen to review the “purported miracle”. She was, understandably, reluctant to diagnose without having examined the patient. She said it sounded like he had a tension in his larynx, which could be faked. I asked her whether this could be considered a miracle. Her response: “sure, if you believe in miracles but I would look for a non-miraculous explanation”. … and she wouldn’t know David Hume from David Beckham. TAM, You call it snake oil and your wife offers a diagnosis after having decided that it can’t be a miracle. According to the account the man offered, it was not tension of the larynx but the result of a serious disease, and his doctors had advised him that he may never speak normally again – yet your wife decided that this is false, and it was tension of the larynx all along. So in other words, you say that he is misrepresenting the facts. They guy has written a book about his experience. Why not look further into it? Or, to be a bit more honest about what you’re doing, why don’t you just say up front that anyone making a claim that they have personally been involved in a miracle is, like this guy, lying? I mean, whatever the scenario offered to you, whatever the reported facts, it’s not a miracle. Right? It’s not a lie if he believes it’s true. I must admit that I find supposed miracle healing one of the most offensive religious superstitions. If your God can truly heal, why doesn’t he heal every single child suffering from cancer tonight? Presumably he could do it with one hand tied behind his back. Oh well, I guess little kids suffering from neuroblastomas are just part of His master plan …. Are you suggesting that he may have had a mere strain of the larynx, but he himself believed that years ago he had some sort of disease that seriously affected his speech, and he sincerely believes that doctors gave him the prognosis of likely not being able to speak normally again? Really? Surely your claim really suggests that he lied. And that’s what you have to say about every miracle claim: These people are wicked, deliberately deceiving others when they know better. Yes, I am suggesting that chicanery is always more likely than a “miracle”. But no, I don’t suggest that chicanery is behind every miracle claim. One need look no further than “Extraordinary Popular Delusions and the Madness of Crowds” to see that history is riddled with supposed miracles that have natural explanations. I have previously commended a reading of Edmund Standing’s “Against Mythicism: A Case for the Plausibility of a Historical Jesus” from Think: Philosophy for Everyone 9:24 (2010)and I will do so again. Well I have to say, I’m still scratching my head over the thought that he had something like a strain and yet believed all the terrible things that he claims to believe about his condition. Essentially, this means that any claims that suggest that a miracle have occurred will be deemed false by you. What, then, is the point of asking for examples of miracles? 1. Cure all kids around the world suffering from cancer. 2. Revelation in the form of Bible verses encoded in DNA. 3. Jesus on CNN tomorrow night. That would shut up the atheists wouldn’t it? But why stop at that. Your God could just take over all television networks for as long as he liked. 4. I wake up tomorrow morning and can comprehend string theory. 5. My 7 and 4 year old boys stop fighting and whining, just for a day. Now that would be a miracle. So in other words, if it was claimed that in individual got his voice back miraculously, and even if it was a bona fide miracle, you would, no matter what, know that it didn’t happen? Wow… do you not think you’re at all dogmatic? Even a little? All [my] sarcasm aside, let’s assume (for the sake of argument) that the preacher vocal cors were irreparably damage and “miraculously” regenerated during his speech. Why is it more likely that the Judeo-Christian god is responsible than a thousand celestial fairies acting in unison? Just wondering. As long as someone is willing to admit that you’re wrong, I don’t see how you they can be fairly called dogmatic. I (like Richard Dawkins) freely admit that it is possible that the Judeo-Christian god exists. Do you admit that it is possible that there is no god? If you won’t make this admission, it is you who is being dogmatic. If you will make this admission, we just disagree on the relative probabilities of the two assertions. T.A.M., nobody is claiming that the occurence of a miracle proves or shows that the Judeo Christian God is the right one. What’s more, you’re obviously mistaken when you say that unless a person is willing to admit that they could be mistaken about something then they are dogmatic. There are many claims that it is not sensible to doubt at all (e.g. “I see a tree,” “squares have four sides,” “I am happy,” “there is no limit to the number of odd numbers”). Analytic truths, obviously demonstrated empirical facts, properly basic beliefs, nobody has to say that they could be wrong about these in order to avoid the “dogmatic” label. If you’ve been listening to the podcast lately you’ll know of the account of theism as a properly basic beliefs, and it’s simply unreasonable to require people to doubt their basic beliefs. You may as well doubt that you know anything at all. If however a person has no a priori reason to reject the possibility of miracles and yet they always do, then I don’t see how they can avoid the label of dogmatic. But surely anyone who claims that a limb had been regenerated would be lying. Re: The voice guy – what circumstances surrounding his recovery would have persuaded you that he had actually been miraculously healed? Are there any such circumstances at all? Any at all? Or would you say that anyone who claimed that such circumstances had come to be was actually just lying? and also.. just because there is CURRENTLY no “acceptable” evidence for a Bigfoot, do we automatically conclude there can be no such thing and give up looking, investigating and critically analysing any evidence? That miracle is pretty weak Glenn. And lets face it you are in no position to judge whether or not it is a hoax. Perhaps if you could provide a link to interviews with his doctors, or to the original medical records when he was assessed. Basically you are expecting people to believe an account of a miracle based on one persons say-so and a recording. Questions – how often do people recover from his exact condition? I have no idea – I am not a doctor. Had this ever happened to him before – ie. did his voice have good and bad days? – I have no idea, I only have access to one recording. It *may* be a miracle – but if that is the best you can provide then I can see every reason for skepticism. Max, the guy has a website and sells a book about it. Sure, he makes money from the book – but the point is, it’s not like he’s coy with providing as much of the evidence as he possibly can. The conditions you’re implying are really just conditions that suggest dishonesty on his part – maybe, you suggest, it was a condition that comes and goes. But according to his account this is false. In short, I fully grant that if the facts are not as stated, then it’s a weak case. But then, that’s the issue. If I saw the other evidence I might be convinced. I am sure miracles continue to happen – I just think that the weblink you provided on its own is unlikely to convince anyone. If a miracle is defined as ‘an event which is genuinely* observed to have occurred, and for which no natural explanation exists’ then of course I observe many such events, and so do you, and so indeed does every one of us. I propose to observe one tonight, when I shall retire to bed, place my expensive Sennheisers over my ears, and listen to Idil Biret playing Chopin’s Piano Concertos 1 and 2. The pleasure I shall experience cannot be explained naturally, and is therefore — in at least one sense of the word — a ‘miracle’, even though it can be observed by only one person, in this instance myself. This annoys me. The logic here is that since he (the guy in the video) could have possibly misled people (whether on purpose or accidentally) then he therefore must be misleading people (whether on purpose or otherwise).